DocuSign is one of our favourite web tools you can use to securely send electronic signatures from Google Drive and Gmail. You simply hover your cursor over Gmail attachments to sign them. 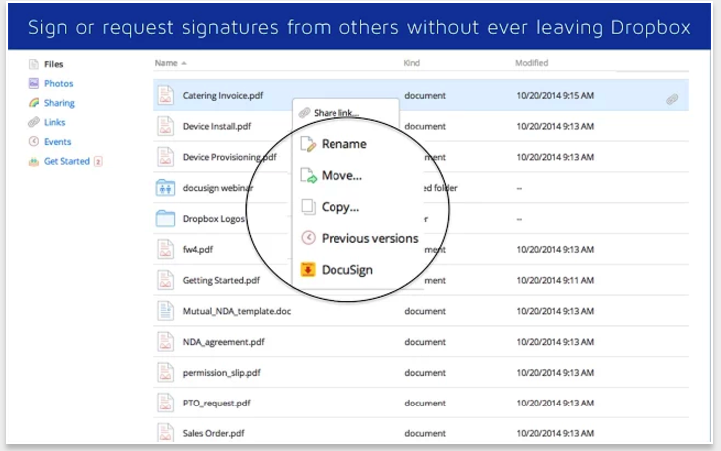 Signed documents and PDFs are automatically included in the original email to be sent back. You can also use DocuSign Chrome extension to sign documents right from your Chrome browser. Besides signing documents, you can use this tool to request e-signatures from others. Send your documents to anyone to sign via email, Dropbox, Box, Evernote, Google Drive and many more. However, while you can sign unlimited documents for free on your account, only the first 3 signature requests are free. Other interesting features from DocuSign include: ‘View document status immediately, reminder signers, and get notified when you need to sign a document; Create and customize your personalized signature; offline access allows you to sign even when there isn’t internet connection; guide your signers with “Sign Here” tags that show precisely where to sign, initial, or add additional information; remind signers a document is waiting for them to sign with a single tap; receive real-time push notifications when a document has been signed, and many more. 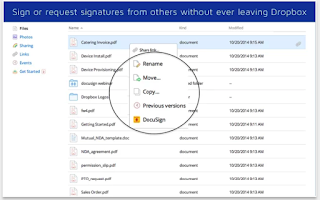 DocuSign is available for the web, iPad , Windows and Android.